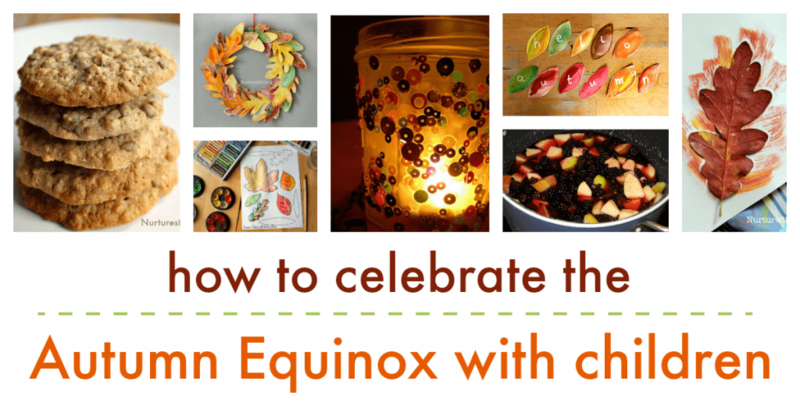 Use this guide on how to celebrate the autumn equinox with children to learn about the new season and to welcome autumn into your home and classroom. 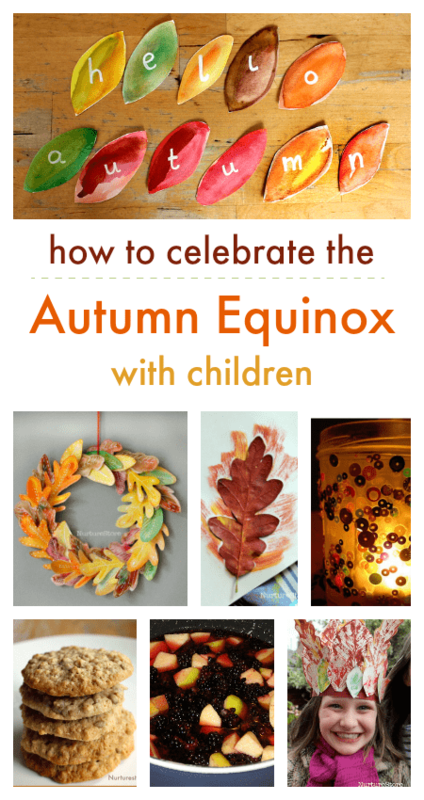 Use these ideas to learn about the autumn and the changing seasons and celebrate the equinox with your children. The way the Sun, Earth, and Moon move around in relation to each other gives us our day and night; our spring, summer, autumn, and winter; and the cycle of the natural year. One important thing to know is that the Earth is tilted. As it moves around the sun it doesn’t sit straight upright with the North Pole exactly at the top and the South Pole exactly at the bottom. Instead, it leans to one side a little. This tilt is very important, because it means at certain times of the year more of one part of the Earth is facing the sun than at other times. This tilt gives us our seasons. In June the northern part of Earth is titled towards the sun, and this means we get the most hours of sunshine – giving us short nights and the longest day of the year. It’s when people living in the northern part of Earth have summer. In September, the Earth has moved further around the sun, and now the tilt means that the sun is facing right at the middle of the Earth. The rays of the sun are shining on the northern and southern parts of the Earth equally. This means we get about the same number of hours of day time and night time. We call this time of year autumn, and the day of the year when we have the most equal day and night is called the Autumnal Equinox. After the Autumnal Equinox the tilt of the Earth means we will get fewer of the sun’s rays shining on our part of the world each day. The days will get shorter, and the nights will get longer, all the way through to the shortest day of the year at the Winter Solstice in December. We’ll learn more about this in the Winter Unit. People living in the southern hemisphere have their seasons at the opposite time of year to us, so when we are having autumn, they are having spring. When is the autumn equinox? In 2018 the autumn equinox is on Sunday 23rd September. The start of the autumn season has been celebrated by people for centuries. It’s a wonderful way to connect with the natural rhythm of the year and make our homes cosy for the new season. Decorate your front door with a gorgeous leaf wreath. Head out on a themed-nature walk to look for signs of the autumn. Collect leaves and make leaf prints. Use seasonal foods to make a feast. Try apple crumble, sunflower seed cookies, or blackbery jam. Use natural materials to create a seasonal sensory tub. Welcome the darker nights by lighting your home with jam jar candle holders. Host a light parade with paper lanterns. 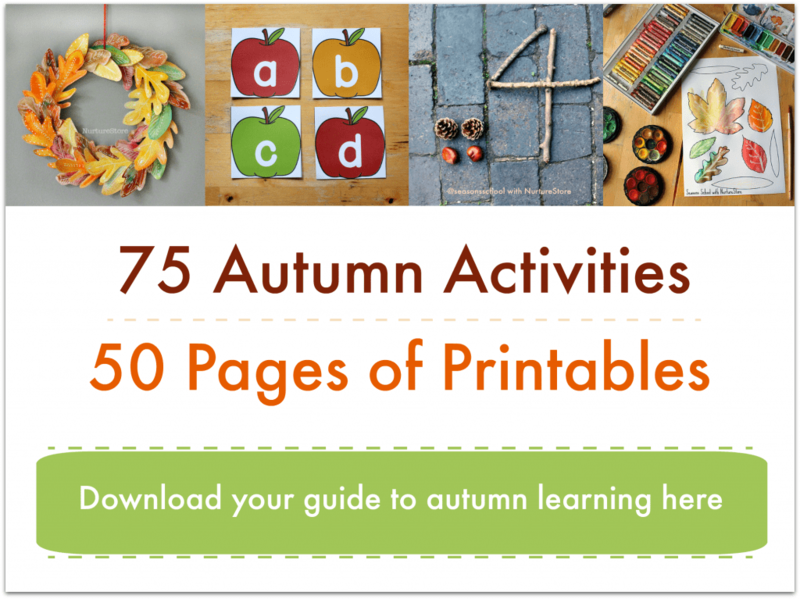 Use these autumn printables to learn about apple and pumpkins, twigs and leaves.